October 24, 201-5-2,096 women and girls came together dressed as Rosie the Riveters to raise awareness for the Save the Willow Run Bomber Plant campaign in Ypsilanti Michigan. They came from sixteen states, some from Canada, and there were even 44 “real Rosies” from the WWII era. AND they blew the lid off the record set in September at the Rosie the Riveter/WWII Home Front National Historical Park in Richmond, California. The goal of the campaign “….is to mobilize the resources needed to preserve and renovate roughly 144,000 square feet of the 5 million square foot former Willow Run Bomber Plant, to eventually become the new home of the Yankee Air Museum. 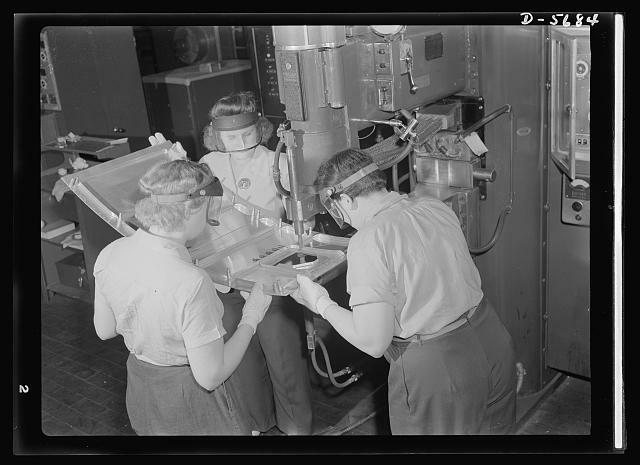 The Willow Run Bomber Plant began production in 1941, first to build component parts, then–with the help of many women (the original Rosie the Riveters) they manufactured the B-24 Liberator.